I grew up in a coastal Maine community and was fortunate to spend my formative years on Green Lake in Ellsworth. After graduating from the University of Maine in Farmington I headed for graduate school in Canada. Within months of graduating from the University of Manitoba, I was back in Maine where I have remained since. I now live with my wife Denise along the Kennebec River in Vassalboro. It’s a beautiful stretch of the river with lots of wadable shoreline. Long before building our home on the Kennebec, I was hooked on Maine’s smallmouth bass. During the past thirty years I have fished hundreds of Maine’s lakes and rivers. In those early years I spent most of my time in pursuit of Maine’s brook trout and landlocked salmon. And, while Maine is well known for its cold water fisheries, it is the abundant wild populations of smallmouth bass that I most enjoy today. Unfortunately, for a host of reasons, including its non-native status, smallmouth bass are often overlooked by both fly and spin fishermen. Three Rivers Guide Service aims to change that outlook. Maine’s abundant smallmouth bass populations, coupled with their willingness to take both surface and subsurface flies readily convinced me that guiding for smallmouth would be productive and lots of fun. With ten years of guiding under my belt, chasing smallies on Maine rivers remains a passion. In the early years, my clients fished from an Old Town row boat. 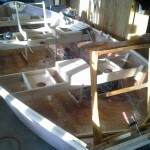 It was a serviceable boat, but that era came to an end after I built my first Freestone Drift Boat. Building my own boat was a rewarding experience and perhaps more importantly it is a perfect boat for Maine’s smallmouth bass rivers. 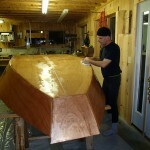 In fact, I had so much fun building the first boat, last year I built another Freestone drift boat. 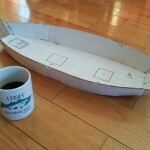 A designer at heart, I altered the interior layout of the second boat to improve its overall functionality. Today, guiding smallmouth bass fishermen has become my passion. With the Androscoggin, Kennebec and Penobscot Rivers all boasting healthy self-sustaining populations of smallies, I can’t think of a better way to spend a day than casting to smallmouths from a comfortable drift boat. So, whether you are a seasoned bass fisherman or want to experience smallmouth bass for the first time, let Three Rivers Guide Service help you make the connection.